It’s been over fifty years since Title VII, the section of The Civil Rights Act that prohibits workplace discrimination. But how far have we really come? Fortune’s data team recently released their findings on the diversity and inclusion practices of the companies on this year’s Fortune 500 list. The big reveal? Only 3% of this year’s companies are transparent about the demographics of their workforce. And of those sixteen transparent companies, 72% of senior executives are white males. Now, more than ever, companies and organizations are feeling pressure to not only be more representative but also more inclusive of people from traditionally marginalized groups. Reports on gender and racial diversity in tech have forced the industry to make public commitments to increase diversity in their workplaces and inspired other companies to do the same. Millennials are demanding more inclusive work cultures. Our sociopolitical environment has made conversations about the inclusion of marginalized people in every area of life absolutely critical. And according to Deloitte’s 2017 Human Capital Report, 78% of respondents now believe diversity and inclusion is a competitive advantage. But if major companies can’t even talk publicly about diversity, what do conversations inside of these organizations look like? “Traditional” approaches to diversity — training focused on compliance and avoiding litigation, or negative-incentive policy (i.e. “do this or get out”) — can actually backfire in terms of diversity outcomes at an organization. In fact, companies that implement required diversity training programs and directives have seen a backlash in the form of more animosity towards other groups; from micro-aggressions that push targeted groups out of decision-making and leadership, to outright discrimination in hiring and promotion decisions. In spite of the training and policy, workplace culture hasn’t changed. There are numerous articles about how organizations are inhospitable for marginalized people. Giant bodies of research on implicit bias have shown that we continue to act in ways that don’t promote equality, even when we’re not overtly trying to. These biases have major consequences in hiring and promotion decisions, but also play out in work environments themselves. Rather than confront these biases, most workplaces assume people will “do the right thing” to make the culture a welcoming place. But it doesn’t always happen that way. So, how are things changing? And what do we have to do to keep moving in the right direction? As our approaches to diversity and inclusion evolve, so must our language. Diversity is no longer the only word in the mix. In fact, the term has been criticized as a word that actually softens hard conversations about inequality, to the point where folks in the majority absolve themselves of accountability for changing things or confronting their own biases. To really make progress, there are a few more terms we need to consider. First, our conversations about diversity have evolved beyond a focus on whether different individuals are present in an organization, to focus on inclusion: How are different individuals’ perspectives included in important decisions? How often are peoples’ voices silenced? Is this an environment where people feel like they can “show up” authentically? Are differences valued, rather than merely tolerated? 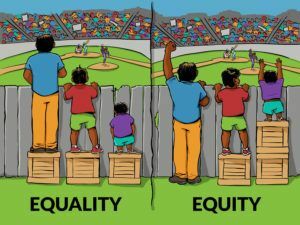 Second, the conversation in organizations is increasingly about equity rather than equality. In a workplace, equity recognizes that not all individuals start from the same place. Equity aims to provide opportunities for historically underrepresented populations of employees to have equal access to growth opportunities and networks that will help close the gap, from leadership levels to all aspects of institutional functioning. If training doesn’t work, what does? Like most organizational changes, nothing will happen overnight. Real transformation will require intense listening, new knowledge, lots of role-modeling from leaders, and the organizational stamina to keep working. Listen to the people who are marginalized: Have we ever stopped to consider that our old approaches aren’t working because they’re often prescribed by the people who already have power? Think about it for a second. There are probably people in your organization who feel marginalized and are trying to talk about it. Talk less, and listen more to them. Give them a seat at the table and the authority to make decisions. Let them lead. Knowledge: We absolutely need to increase levels of understanding on topics related to diversity, equity, and inclusion. The same research on the backlash from “what-to-do” training showed that when people were engaged in developing their own understanding of issues and developing solutions, diversity outcomes improved. There are stellar trainings out there. Look for ones that engage participants in a dialogue about new concepts and help people figure out what to do with the information once they return to work. When people return from these trainings, they should be encouraged to talk about what they learned with their colleagues and supervisors. Remember, training is only one piece of the puzzle. It’s not the solution. Leadership: There are countless studies that show employees take their cues from leaders’ behavior. Leaders have to engage in these same conversations and training and be seen engaging, perhaps imperfectly, in the hard work necessary to change the culture. A lot of this hard work (a lot!) is a willingness to listen (see the first point, above) and accept that there are things that need to change. For many leaders, this is tough. Lean into that. Be open. Guess what? We at gothamCulture have recently acknowledged that even we weren’t talking about these issues as much as we should be. We realized we had some food in our teeth, and knew that there was work to do. We’ve only just begun, and we know it’s going to take a lot more time to identify what it means for our company to take diversity, equity, and inclusion more explicitly into consideration. We not only recognize that our building our capacity here is necessary for our line of work, but that it will be a continuous process. One training won’t do it, nor will reading one article. It’s an ongoing conversation for the entire organization. Ignoring the conversation about diversity, equity, and inclusion is no longer an option for any organization, nor is there an “easy way” through. It’s time to make the commitment to more than training, and start having hard conversations to deeply change our workplace cultures in the long run.